Adam Drake (centre) has been selected for England again. City of Peterborough star Adam Drake makes his annual trip to the over 40s International Home Nations tournament this weekend. Drake will be representing England in a three-day tournament at the Glasgow Green Hockey Centre, the venue for the 2014 Commonwealth Games, which starts tomorrow (May 20). It’s a fine achievement by Drake who is in his last year of eligibility at this age group. He will be the oldest player in a squad that will be defending their title. Drake had to come through tough trials at Beeston to win selection. He’s also represented his country at European and World Masters events. Drake has won world and european medals in his international career. England start their campaign against Ireland tomorrow before tackling Scotland on Saturday (May 21) and Wales on Sunday (May 22). City of Peterborough finished an excellent fifth in the finals of the National Under 14 competition, the final stages of which took place at the Olympic Stadium in Lea Valley last weekend. City beat Bishop’s Stortford 5-2 in the fifth/sixth place play-off game with Joey Evison claiming a hat-trick. City had finished third in their group after drawing with Harrogate 0-0 and losing narrowly to Cheltenham (2-3) and Marden Russets (1-2). 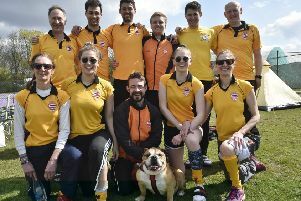 City of Peterborough’s mixed team lost 3-2 to Sutton Coldfield at Bretton Gate last Sunday in the quarter-final of the National Mixed Plate competition.